Wow that Rammen stage looks pretty horrible already. How does it compare to 2016? When many stages were cancelled? It's quite a lot more in the terrain this year, reason Lesjöfors was cancelled in 2016 was that the 10-15cm deep ruts in the gravel froze before they had time to scrape it, I'm sure there would have been no problem to run all stages twice in the end. I checked the weather in 2016 and it was 10-15 days of around +5 then so i think it should be fine this year. I am not sure this is correct image... I have followed around 10 stations in the region all night, it was basically snowing everywhere overnight except Karsltad, some light rain near noon for some stages... 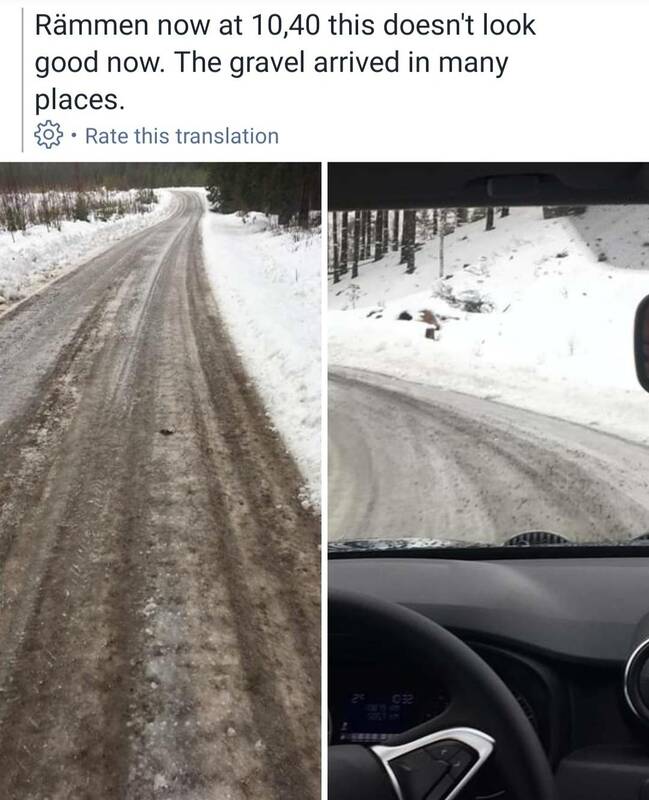 Conditions in Sunday and Friday stages should look very good right now, a bit less good on Saturday stages, but this image does not look right.. And the image was posted.. before it was actually taken? This image that was posted on Swedish Facebook page at 9.40 gmt so 10.40 Swedish time. Also Ogier would be complaining too much, and nobody wants that.